Chaos & Climate – Part 4: An Attractive Idea | Watts Up With That? The IPCC has long recognized that the Earth’s climate system is a coupled non-linear chaotic system. Unfortunately, few of those dealing in climate science – professional and citizen scientists alike – seem to grasp the full implications of this. It is not an easy topic – not a topic on which one can read a quick primer and then dive into real world applications. This essay is the fourth in a short series of essays to clarify the possible relationships between Climate and Chaos. This is not a highly technical discussion, but a basic introduction to the subject to shed some light on just what the IPCC might mean when it says “we are dealing with a coupled non-linear chaotic system” and how that could change our understanding of the climate and climate science. The first three parts of this series are: Chaos and Climate – Part 1: Linearity ; Chaos & Climate – Part 2: Chaos = Stability ; Chaos & Climate – Part 3: Chaos & Models. Today’s essay concerns the idea of chaotic attractors, their relationship to climate concepts, and a short series wrap up. It is important to keep in mind that all uses of the word chaos (and its derivative chaotic) in this essay are intended to have meanings in the sense of Chaos Theory, “the field of study in mathematics that studies the behavior of dynamical systems that are highly sensitive to initial conditions”. In this essay the word chaos does not mean “complete confusion and disorder: a state in which behavior and events are not controlled by anything” Rather it refers to dynamical systems in which “Small differences in initial conditions …yield widely diverging outcomes …, rendering long-term prediction impossible in general. This happens even though these systems are deterministic, meaning that their future behavior is fully determined by their initial conditions, with no random elements involved. In other words, the deterministic nature of these systems does not make them predictable.” Edward Lorenz referred to this as “seemingly random and unpredictable behavior that nevertheless proceeds according to precise and often easily expressed rules.” If you do not understand this important distinction, you will completely misunderstand the entire topic. If the above is not clear (which would be no surprise, this is not an easy concept), please read at least the wiki article on Chaos Theory. I give a basic reading list at the end of this essay. “…an attractor is a set of numerical values toward which a system tends to evolve, for a wide variety of starting conditions of the system. System values that get close enough to the attractor values remain close even if slightly disturbed. 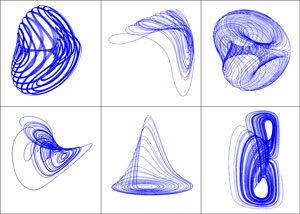 In previous parts of this series, I have shared examples and images of various attractors. 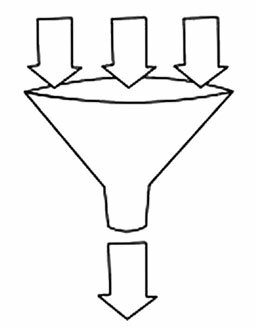 The household funnel is the simplest physical example. When held with the spout pointing down, any object entering the mouth of the funnel tends down and out the spout. Exact placement in the funnel mouth doesn’t matter, all points lead to the spout. The funnel represents a type of attractor called a point attractor. Once the system enters the attractor, the value evolves towards this single point. A cyclical attractor might have two or three values (ranges in some cases), cycling between them. We see this in certain values of the Bifurcation Diagram, expressed as the Period Doubling that leads to chaos. Kicking the value out of line upward at year 100 has a similar result. Adjusting the “r”, the forcing value, down a bit at year 150 brings the stable attractor lower, yet the behavior remains stable, as always. In the above example, the attractor of the system is a single value, to which the numerical value tends to evolve even when perturbed. In other systems, the graphed values might appear to spiral in to a single point or travel in complicated paths that eventually and inevitably lead to a single point. Following from the Bifurcation Diagram, one sees easily that at some values of “r” the system becomes cyclic, with periods of 2, 4, 8, 16 as “r” increases until chaos ensues, yet past that point one still finds points, values of “r”, where the period is 3 then 6, 12, 24. Each vertical slice through the diagram presents one with the attractor for that value of “r”, which could be represented by their own geometric graphic visualization. Some dynamical systems do the opposite – no matter where you start them, one or more values races off to infinity. Lorenz’s famous Butterfly Attractor (named for the two reasons 1. It looks a bit like a butterfly’s wings and 2. In honor of the Butterfly effect), is often used as a proxy for “the attractor” of Climate (with the initial cap). Readers who want the full blood-and-guts version of why this is nonsensical (other than in a trivial way) can read Tomas Milanovic’s Determinism and predictability over at Judith Curry’s excellent blog, Climate Etc. (Be sure to go through and read all the comments from Tomas Milanovic, David Young and Michael Kelly). Those with more pragmatic tastes (and a more common, lower, level of understanding of higher maths) can read my post (also at Dr. Curry’s) Lorenz validated. Let me just make a couple of obvious points for those who don’t have the time to watch the two 13 minute films or read the two Climate Etc. posts. 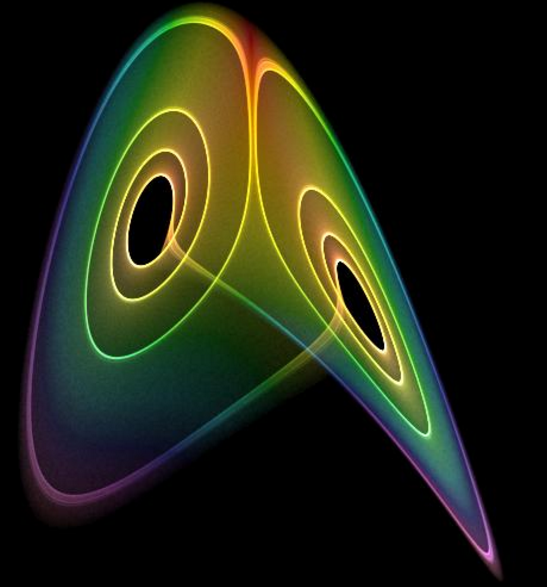 One must use very specific parameters to get the Lorenz equations to produce the Lorenz Attractor – other parameters produce single point attractors,. Looking at arbitrarily selected “regions” of the Lorenz Attractor – and saying “they could represent conditions of hurricane, drought or snow” is disingenuous. The attractor has no snow, no rainfall or drought (as the equations are about fluid flow in two-dimensions under temperatures differences, it might describe some thing resembling a hurricane, if applied to a real physical system, such as the famous washtub experiments of atmospheric circulation). Regions of the Lorenz Attractor do not represent weather of any kind whatever. We have absolutely (literally absolutely) no idea what the precise, or even an, attractor for the weather or climate system might look like, separate from the long-term historic climate record. We have no reason to believe it would be statistically smooth or even if it would be amenable to statistical analysis. Given all that, the idea that the climate system might have the physical equivalent of a chaotic attractor, even if it is a strange attractor, is still quite appealing to many. If it did, and we could discover it, mathematically or physically, we might then attempt some kind of statistical analysis of it to have some idea of the probabilities of what climate might do in the future. But only probabilities, and “probabilities of what” is highly uncertain. Remember, the climate covers the whole planet, and while we are mostly interested in what takes place close to the surface, it happens at all levels – a huge complicated area in both space and time. The possibility of analysis that would reveal useful statistical probabilities for even general climate issues such as hard or mild northern hemisphere winters in anything but the near-present, certainly less than a decade, is unlikely. Even if, by some quirk of fate, we were able to stumble upon the structure of the multi-phasic attractor of Earth’s climate in the present day, which could then somehow magically be analyzed for statistical probabilities in a useful spatial and temporal way, such as seasonally for a specific region over the next decade, they would still just be probabilities, with only one actuality allowed. After that, the minute alterations of the ever-changing initial conditions and determining parameters of the system would lead to unpredictable differences in the attractor or even a shift to a new attractors altogether. These issues make the possibility of long-term useful predictions of the climate impossible. But can we make any useful predictions about the climate? Of course we can! If there is a shift in the northern jet stream, we can predict things about near-term European seasonal weather. If an El Niño develops, we can predict certain general weather and climate conditions. If there is a persistent blocking high in one area, weather is predictably affected downstream. Where does our ability to make these predictions come from? From models? Only models of the past – looking at the historical climate, recognizing patterns and associations, checking them against the records, and using them to make reasonable guesses about what might be coming up in the near future. 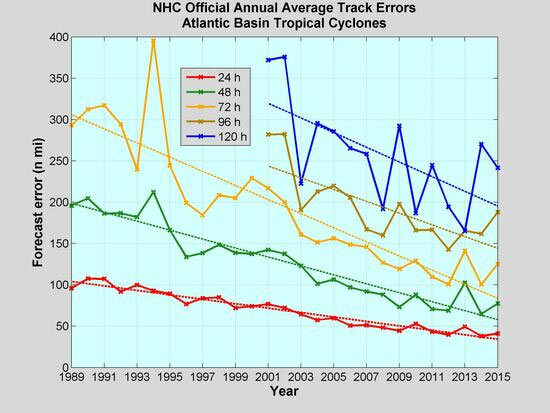 We can make weather/climate predictions about the near-future in some cases – hurricane-path prediction models are “pretty good” out several days, certainly good enough to issue warnings and for localities to make preparations, with a current average track accuracy of a bit better than +/- 50 nautical miles at 24 hours out. The error increases with time – at 48 hours 75 miles, at 72 hours 100 miles, at 5 days it is 200 miles. These results are about one half of the track errors in 1989. This accuracy was enough to warn the barrier islands of Brevard County, Florida (Cape Canaveral, Cocoa Beach, Patrick Air Force Base) for the recent major Hurricane Matthew – the islands were evacuated based on 24 hour predictions of a direct hit. Live television broadcasters called this “the little 11th hour shift” that saved Cape Canaveral – the center of Matthew shifted east 20-30 miles, making the difference between the direct landfall of the eye of a major hurricane on the highly developed barrier islands and the effects of a near-miss pass 30 miles off-shore. You can watch this evolve in an animation in the National Hurricane Center’s archive of Hurricane Matthew. How can we best predict future climates? I maintain that the best chance of determining the probabilities of climate long-term future outcomes lies in the past, not in mathematical, numerical modeling attempts to predict or project the future. We know to varying degrees of accuracy, temporally and spatially, what the climate was in the past, it has had tens of thousands of years to go through its iterations, season to season, year to year, and has left evidence of its passing. The past shows us the actual boundaries, the physical constraints of the system as it really operates. Some maintain that because we are changing the composition of the atmosphere by adding various GHGs, mostly CO2, that the present and future, on a centennial scale, are unique and therefore the past will not inform us. This is trivially true, the present is always unique (there is only one, after all). But similar atmospheric conditions have existed in the past. Has this exact set of circumstances existed in the past? No. If nearly these circumstances had existed, would this tell us what to expect? No again, climate is chaotic, and profoundly dependent on initial conditions. This has nothing to do with the question of whether or not, or how much, increasing CO2 concentrations will add energy (by retention) to the climate system. That question is simply a matter of physics – if GHGs block outgoing radiation of energy, then the blocked energy will remain in the system until such time as a new equilibrium is reached. What the effects of that energy retention will be are what the various branches of science are investigating. Making early decisions and assumptions — no matter how reasonable they appear — would be an error – along the lines of those made in physics regarding the expansion of the universe. So, why study the past to know the future? It is my view, shared by others, that the climate system is bounded – limited in its possibilities – and that these boundaries are “built-in” to the dynamical climate system. From the historical record, the climate system has an apparent or seeming overall attractor, one could say, outside of which it cannot go (barring something like a catastrophic meteor strike). 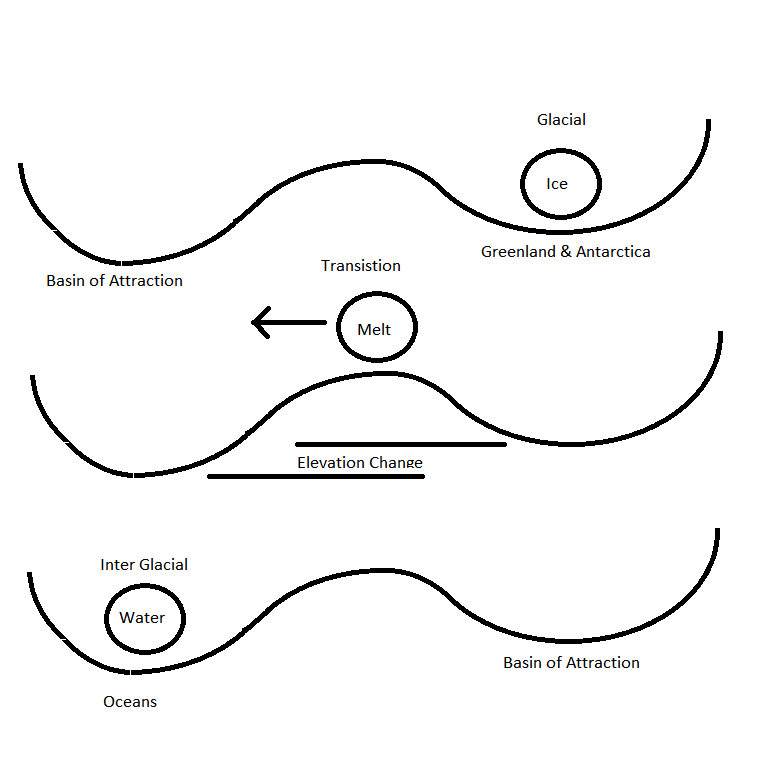 Included in that attractor are the two long-term states known as Ice Ages and Interglacials, between which the climate switches, much like a two-lobed chaotic attractor. We have little understanding of what causes the shift, but we know it takes place and how long interglacials of the past have lasted. We also know that during the past interglacials, the average surface temperature of the earth has been remarkably stable – staying within a range of 2 or 3 degrees, producing a period during which Mankind has thrived (for better or for worse), with apparent Warm Periods and Little Ice Ages (cooler periods). There is no evidence other than the historic record for labeling this the or an attractor of the system — but it has the appearance of one. This sounds a bit like I am saying that we can’t predict the far-future climate because of chaos therefore we must look to the [chaotic] past to predict the climate. Almost, but no prize. It is the patterns of the past, repeating themselves over and over, that inform us in the present about what might be happening next. Remember, chaotic systems have rigid structures, they are deterministic, and Chaos Theory tells us we can search for repeating patterns in the chaotic regimes as well. Of course, this is exactly how weather forecasting was done prior to the advent of computers. The experience of the weatherman, well educated in the past patterns for his/her region, would look to the available data on regional temperatures, air pressures, cloud type and cover and wind directions, and give a pretty good guess at the coming day’s and week’s weather. The weatherman knew of bounds of weather for his locality for the calendar date, and with his knowledge of the weather patterns for his area, could feel confident of his general forecast. At this point I would have written about the problematic essence of numerical climate models – Chaos and Sensitivity to Initial Conditions. I would have run some chaotic formulas, made tiny, tiny changes to a single initial condition and shown how those changes would make huge differences in outcome, then liken this to modern GCMs, general circulation models, the type of climate model which employs a mathematical model of the general circulation of a planetary atmosphere or ocean. The 30 North American winter projections were produced as part of the CESM-Large Ensemble project, running the same model 30 times with exactly the same parameters with the exception of a tiny difference in a single initial condition – “adjusting the global atmospheric temperature by less than one-trillionth of one degree”. I will not repeat the essay here – but it contains what I would have written here. If you haven’t read it, you may do so now: Lorenz Validated. The hope that statistical analysis of climate model ensembles will produce pragmatically useful probabilities of long-term future climate features is, I’m afraid, doomed to disappointment. Weather models today produce useful near-present, daily forecasts (and even weekly for large weather features) on local and regional levels and may produce useful short-term-future weather predictions. When coupled with informed experience from the past, weather/climate patterns, they may eventually provide regional next-season forecasts. The UK’s MET claimed this result recently, bragging of 62% accuracy in back-casting general winter conditions for the UK based on pattern matching with the NAO. Judith Curry’s Climate Forecast Applications Network (CFAN) is working on a project to make regional-scale climate projections. Success of these longer range projections depends in large part on the definition used for “useful forecasts”. 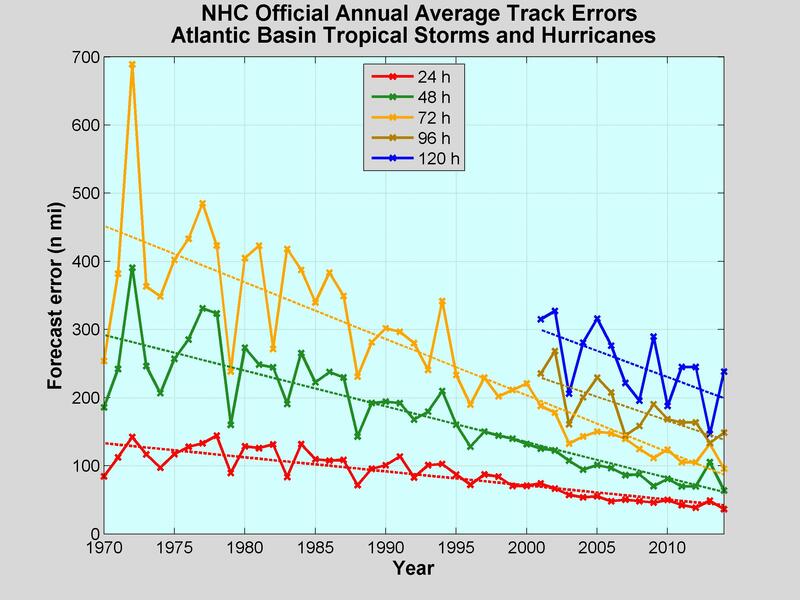 Hurricane path and intensity models have halved their error margins since 1990, achieving a useful average predicted-path accuracy of +/- 50 miles at 24 hours with an accuracy of +/- 200 miles at 5 days. Hurricane Matthew’s 11th hour shift may be an illustration of these models having nearly reached the limit of accuracy. At the end of the day, a deep and thorough understanding of Chaos Theory, down at its blood-and-guts roots, is critical for climate science and should be included as part of the curriculum for all climate science students – and not just at the “Popular Science” level but at a foundational, fundamental level. Since I will still be declining to argue, in any way, about whether or not the Earth’s climate is a “coupled non-linear chaotic system”, I offer the above basic reading list for those who disagree and to anyone who wishes to learn more about, or delve deeper into, Chaos Theory and its implications. Also, before commenting about how the climate “isn’t chaotic”, or such and such data set “isn’t chaotic”, please re-read the Definitions section at the beginning of this essay (second section from the top). That will save us all a lot of back and forth. I hope that before reading this essay, which is Part 4, that you have first read, in order, Parts 1 , 2, and 3 . As the essay Lorenz Validated was originally intended as part of this essay, it is suggested reading. I will try to answer your questions, supply pointers to more information, and chat with you about Chaos and Climate. October 22, 2016 in Chaos and Climate, Climate News. ← Aussie Chief Scientist: "We have [climate] models to try to predict what that will be and that's difficult"
While it is chaotic, there are still forces that cause macro changes that should be predictable. For instance I can reliably predict in the temperate zones it will be hot in the summer, cold in the winter, spring will start cool and end warm and fall will start warm and end cool. How hot and how cold in each of the seasons is up for grabs. rbabcock ==> This is a common reaction to the concept of Chaos, Weather and Climate, to the statement that climate is chaotic and can not be predicted long-term, and it is not wrong for you to bring it up. It is numeric climate modeling and its ability to predict long-term climate states, to answer questions like these, that are the issue. Of course we can all predict trivial things about weather and climate — children can do it by pattern recognition “Summers are hotter than Winters”. We do pretty good weather prediction on the basis of a few days to a week, but because of the Chaos problem, we can not reliably predict such things as “a hard winter” or a “rainy spring”, even a year ahead, no less climate 50 or 100 years from now. My point is there are macro forces that cause things to happen in predictable ways and they are not trivial. Something caused the Maunder Minimum. Something caused the last ice age and it was enough to form ice sheets 5000′ think. How we got to the end point wasn’t a straight line as there were no doubt lots of feedback mechanisms and this is where chaos comes into play, but whatever was causing the overall trend kept pushing the ball down the road. The real problem is we don’t know yet what the big forces are that change the course of the ship. If a quiet Sun causes substantial global cooling, there will be a lot of buffers in play that gives us warm and ever colder temperatures until either the Sun becomes active again or a final equilibrium is achieved. The chaos theory has got more to do with weather and random local variations than long term global average temperatures, which exists even if we can’t measure it. Let’s not make things hopelessly complicated. Yes, temperature vs. heat transfer is nonlinear because things like changes in water states. But global net heat in and heat out still dominates. Richard Petschauer ==> If climate science were ONLY about long-term global average surface temperature (which it is not), then we would not have to worry so much about the fact the the climate system is a chaotic dynamical system. You are right about that. Your cone gizmo does not seem to address the point, as to whether the trajectory of the system into the entrance aperture of the cone makes any difference. A related question might be, whether photons from some remote location can enter the input aperture of the cone from a full 2 pi steradian hemisphere, and then assuming no losses inside the cone, all exit from the nose of the cone at the bottom. The requirement of no losses, implies that the cone walls cannot be absorbing. They could of course be scattering, with any arbitrary scatter function reflectance, and in that case it is clear that many of those photons must scatter backwards, and hence exit the cone from the front. So clearly in that case, all photons cannot exit the bottom of the cone. So what then if the cone surfaces, are perfectly specular perfect reflectance surfaces, so once again no absorption losses. In this case, it can be shown that once again not all of the photons can exit from the bottom of the cone. In fact only a small fraction of the photons can exit from the bottom, and that fration is simply the area ratio of the apertures. So if the top of the cone has ten times the surface area as the bottom of the cone; regardless of the shapes of those (presumed flat) areas, then only 10% of the photons can exit the cone from the bottom. The number of photons per unit area in the 2 pi steradian input and output beams must be conserved. This is a consequence of the second law of thermo-dynamics, so for the last instance 90% of those photons must be reflected back out of the top of the 10:1 funnel. So a real world cone in a real world physics, cannot direct all photons through that cone from input to output one way. So what of your attractor; does it have any such constraints ?? George ==> Its just a kitchen funnel — which my wife uses to fill vinegar bottles. Nothing more, It is an analogy. I haven’t studied chaos theory but I have studied systems and control theory extensively, and that gives me at least some trained intuition in systems behavior. I think the main point here is that in the coupled nonlinear chaotic model there are no “big forces that control the course of the ship” outside the feedback system, as your comment seems to say. If there were, initial conditions would pretty much be irrelevant. Rather, the “big forces” are just other feedback loops–stored system energy that is returned to the system in all kinds of unexpected ways and at unexpected times. By the way, I spent a career in the U. S. Coast Guard and also have a trained intuition about the big forces that control the course of a ship. It’s a useful metaphor, but it would be more useful if we pictured a helm controller that set desired course as the unknown weighted sum of inputs from voting boxes (like in America’s got talent) distributed not only to each crew member, but also to spouses and sweethearts, local fishermen, drug smugglers, and random people standing on the pier on the day of departure. deanfromohio ==> I hold a “Captain’s license” from the USCG and understand the metaphor. The problem can be likened to that of the Iron Mike (as we used to call the autopilot in the Merchants) — it has orders to steer a successful course by compass, but is kicked off course by a whole lot of influences (wind, waves, currents, bent rudders, and in twin-screw ships uneven props, uneven engine speeds, etc. It manages by making repeated corrections to the results, taking each instant (with programmed delays for the ship design to correct for “meeting the helm” to prevent over-steering). Regardless of the chaos of the seas, it manages in the long run to get you where you are going. Climate likewise is “self-steering” [sort of], being constrained to certain patterns (it can’t make tropical poles and arctic equators, for instance). But like the Iron Mike, climate will make the adjustments in a seeming random pattern (I have watched the very sophisticated auto-pilot work on my sailboat for too many hours — making minor adjustments port and stbd that seem silly, but get us there none-the-less.) What we don’t understand are the nature of all the influences on the climate, the size of those influences, the sign of those influences — then tack on the fact that the overall system itself is prone to chaos and all we can do is watch it work, really. There will be no predicting long-term climate states with numeric models. Thanks, Kip! It’s good to “meet” another mariner. Autopilots are nice, when they work. Also, it takes a seaman’s eye, so to speak, to recognize when the conditions exceed the capabilities of the autopilot, making it safer to steer by hand. Large following seas come to mind. Short of a divine hand, however, we are pretty much on climate “autopilot” but can’t pretend we are the ones in control. Securing for sea always beats counting on any particular weather. So one from column A, one from column B, and one from Column C.
That’s the same recipe that Mickey Spillane uses to write his whodunit novels. It is still in use today, by overly paid think tanks to come up with catchy names for new companies who then want to have an IPO and collect a lot of free money from eager investors who have too much money and not too much sense of gobbledegook. The pictures are pretty, but to me they are far too “smooth” to represent anything to do with the climate. And I prefer fractals anyhow; prettier pictures, and even less informative. The Old Man ==> Did you spend hours, late into the night, watching as your computer added one pixel at a time to a complex image of a fractal on your green screen monitor? …. I admit I did. Yes. I did. Probably takes seconds with my new computer if I still had the old code. Well that’s embarrassing. I did it too, with my children. We had a Bondwell with no HDD. We used to let the fractal program run overnight and edited the code to produce a quickie pic to see what was worth drawing. DRDOS 3.4.1. The long term, vaguely predictable effect, was that one son became a talented server manager at a huge company and another is both a robotics technologist and a computer science engineer. I have always attributed this to them having access to a computer in the 80’s in spite of living in a very poor developing country in Africa. Indeed Kip – and then along came a 386 running Fractint! I used to leave the Atari running overnight doing stuff like fractals and ray tracing – it was amazing how realistic reflections could look! Jason Calley ==> Mine knew I was nuts….but always wanted to see the latest results too. Kinda miss those old days…. steveta_uk ==> It was an exciting time — all that computing power, ability to write your own programs, delving into barely known territory….loved it. I still have the students in my computer graphics class generate fractals using IFS tables. Any chance that you could provide this article series, and the Lorenz Validated, as PDF? RPT ==> Email me at my first name at the domain i4 decimal net, and I’ll see what I can do. Thank you, and have great boat trip in NC! Your simplified narrative of Chaos Theory (really Chaos Branch of Mathematics) is really great; Simplifying something that isn’t simple is not easy, and is really the ultimate test of deeper understanding. This leads me to me how I blew my greatest chance of scientific achievement. When en undergraduate in university, I was doing an extended exercise that required a CFD solution of the Navier Stokes, running a RANS with the Pi-Epsilon to fill inn the heavy part of it. But I didn’t get good results: I started dumping the intermediate results with a specific (low) number of decimals, then increased decimals, increasing still to ordinary machine precision, then to double precision. Each time I ended up with different result, a result that ALLMOST converged! Guess the difference between a genius and the rest of us is that when we are sitting under an apple tree being hit by a falling apple, the true genius discovers and quantifies gravity, while the rest of us just gets annoyed! ..Wow, great post, but man, did that hurt my head !! I’d be willing to bet that most CAGW believers would not even bother to take the time to read the entire post !! Awesome job…again !! P.S. ( I’m confused on this comment) …” There is no evidence other than the historic record for labeling this the or an attractor of the system — but it has the appearance of one.” Typo or a word missing ? There is a vast difference between something that “looks like” and when something is “evidence for”. HenryP ==> Yours is an example of “long term averages” and pattern matching. 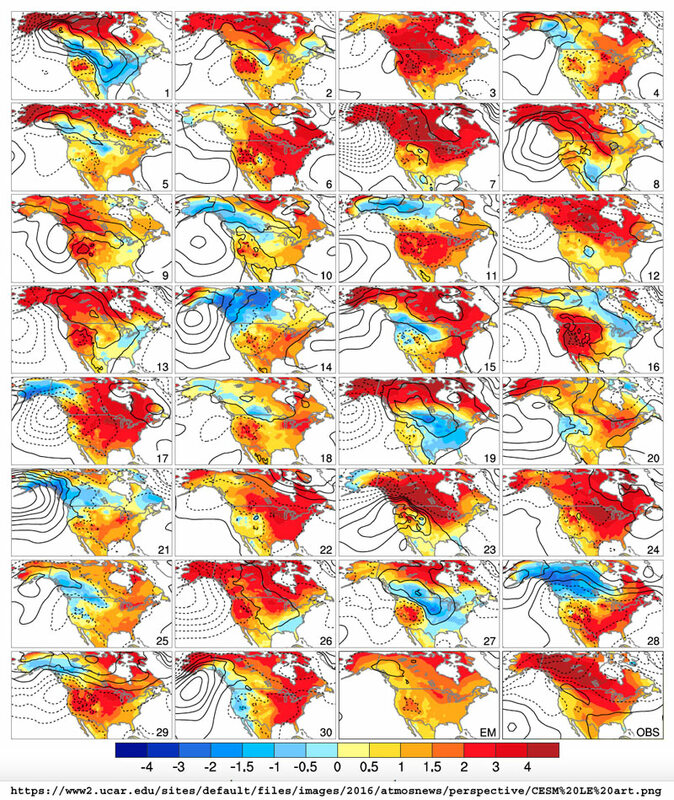 Such patterns can help weather forecasters predict such things as multi-year drought. RSA summer rainfall areas will see progressive drying, peaking in 2021 and then return to “average” conditions by 2025. The cycle is metonic. Well HenryP, why don’t you input your set of data points; those same exact numbers from your first graph, into M$ Excel. And click on a different graph type to give you a sort of cubic spline fit to your data points. Your graph as plotted is not even a graph of a band limited signal, so it is under-sampled by who knows how many orders of magnitude. In other words it is total BS. And no it is not even remotely chaotic; just noisy or fluctuating. Why is it that people who seem to work on “climate science” are the only people in the universe who claim to be doing science who are completely unaware of the Nyquist sampling theorem, or any of the other mathematical bases for sampled data system theory. Real functions of real variables in the sense of real physical systems, do not EVER have points of infinite curvature. Yes, I’ve noticed this too. Another example is the ice cores and other paleo data whose sample rates vary between a few years and a few centuries all within the same dataset and this disparity is rarely accounted for. This is far from surprising since denying first principles is what keeps the CAGW side of the debate from imploding. I’ve read warmist rationalizations about why Lorenz’ work doesn’t apply. Their thinking was so shallow and easily refuted, that I didn’t bother to bookmark the item(s). Wish I had… would make for a good laugh, this afternoon. Sorry about that post. I’ve done the same thing that I was railing against… assertions with no proof. A quick run at my search engine produced hits. One of the 1st was at SkS and I won’t link to that site. Alan Robertson ==> No worries. The fact that there are climate people who don’t understand this topic is the reason I wrote this series. As you read through the comments, you’ll see that some still do not get (or refuse to accept) the important fundamental situation with Chaos and Climate. The climate system is a coupled non-linear chaotic system, and therefore the long-term prediction of future climate states is not possible. Rather the focus must be upon the prediction of the probability distribution of the system’s future possible states by the generation of ensembles of model solutions. Addressing adequately the statistical nature of climate is computationally intensive and requires the application of new methods of model diagnosis, but such statistical information is essential. And this is shown by the ensemble of 30 model runs for winter trend in North America. Chaos means that a very small variation in initial conditions produces different results. That means that there is really no useful connection between those initial conditions and the results. The perturbations, instead, are a good emulation of natural variation, which is also the part of weather history that we can’t predict. And the point of their display is that there is indeed an attractor, shown as the ensemble mean in the second last plot. That is the TAR’s “statistical information”. And you can compare that with the observation, in the final plot. Of course the correspondence is not exact. That is because the observations are of a system which has natural variation. Nick ==> I’d love to see a comprehensive essay on what sort of useful predictions you feel would come from such work. 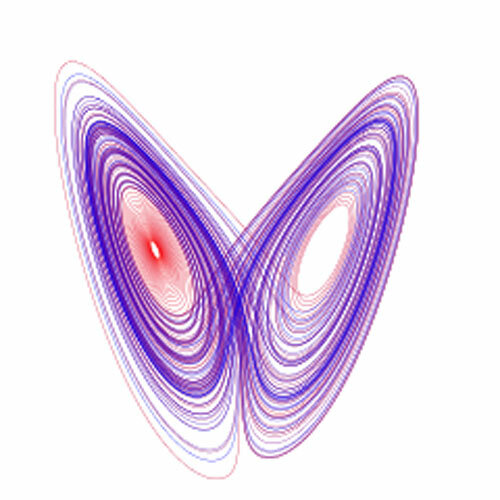 It is a gross misunderstanding of Chaos Theory to say “And the point of their display is that there is indeed an attractor, shown as the ensemble mean in the second last plot.”. The ensemble mean does not fulfill, or even approach, the definition of a chaotic attractor. The mean of 30 chaotic outputs is just that and nothing more — the mean of 30 chaotic outputs. and you estimate those values by sampling, and choosing, as the statisticians say, a measure of central tendency, of which the mean is simplest. You can see this in your butterfly plot. What is the attractor here? 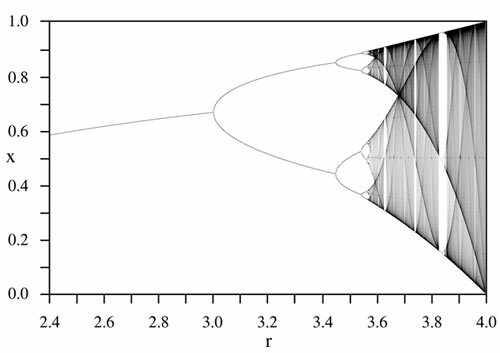 It isn’t the whole plot; it is typified by the purple bent figure 8 traced out in the middle (though it is more complicated here, being a strange attractor). How can I say that? Because the eye does local averaging; that is where the trajectories are most dense. But to put a number on it, you would average over cross-sections, with maybe a down-weighting of outliers. Or you might take a median, or some such. Nick ==> The CESM-LE runs simply do not tend to evolve toward the mean at all….they diverge from the mean, get further away from it, with each iteration. If the CESM-LE experiment on NA Winters were repeated with a time span of 100 years, the ensemble members would be further away from the mean, there would be a greater spread. There may be some meaning, something to be gained, from an Ensemble Mean, but it certainly does not represent a chaotic attractor for the model. The chaotic attractor also has to do with how the system proceeds in time and space, which is represented as the attractor in Phase Space. Ensemble temperatures may not yield anything in terms of an attractor for climate, especially with the amount of measurement error. Plus when you factor in corrections for changes in locations they have made, there’s a boatload of measurement error before you can even begin to start making sense of and running dimensional analyses on data such as this. And finally, the time between measurements is also fairly huge (in terms of trying to understand the system) and you miss a lot of information with only a 1-2 recordings or averages of a days recording, instead of having many temps for 1 day. Yes it becomes more of a burden and eats up more computer time, but if you want less error, have to bite the bullet. Especially with the amount of money they are asking everyone in the world to coughup to fight CO2. But, measuring the multifractal properties of climate is far outside the scope of possibility right now, mostly due to storage requirements, computing requirements, and some further mathematics that needs to be developed beyond multifractals, whatever that may be. The systems people like to draw here are autonomous – they equations themselves are not dependent on time, so you can just let them go with the expectation that nothing has changed when they come back again. There is no need to do different runs; you can just let the same run go on and on. That could also be true for climate with constant forcing, but for real climate it isn’t. That is why, to see the range of trajectories, you have to have multiple runsno evidence of divergence over runs. I think you are confusing it with divergence over time. One thing about your series – I have not seen you show an actual attractor – just a series of trajectories. How would you ever get those “set of numerical values toward which a system tends to evolve” without some measure of central tendency? Nick ==> I’m not sure if this is going to end up to be constructive as we are talking past one another a bit here. I am refering specifically to the 30 Earth’s image and the paper that produced it. 30 runs of identical code and parameters with infintesimal alteration of a single initial value. The 30 runs diverge across the phase space of possibilities. More runs might show more divergence, longer would definitely show more divergence — until the boundaries of possible climates allowed by the model are reached. More runs would not tend to converge on the ensemble mean — running each run longer would also not tend to converge on the ensemble mean. I would like to see you write up what it is you think about the usefulness of statistical analysis of chaotic results — multiple runs of identical climates as in the CESM-LE. “More runs might show more divergence, longer would definitely show more divergence — until the boundaries of possible climates allowed by the model are reached.“. Kip Hansen, you nail it in this statement, but many (particularly those in the warmist camp) will miss the significance. The point is that the model results are not actual possible climates, and they do not in any shape size or form represent anything real on this planet now or in the past or in the future. They are simply the results that are allowed by the model. I’ve written a response below. I have written an initial post here on chaos, CFD and GCMs. I’m planning a follow-up which will have a gadget that lets you generate your own Lorenz butterflies, varying the initial points and parameters, and manipulate the images in apparent 3D (WebGL). I think there are points to illustrate on the relative importance of initial conditions (small) and equation parameters (large), and of trajectories vs attractors. Nick ==> Having arrived, at last, at our winter digs, I’m just catching up. I’ll check out your post ands discuss on your site. Thanks for writing it. Sorry but I can’t accept that. A straight average is an assumpsion of usefulness. Why would each result not need to carry some weighting in the everaging process that we have no understanding of how to evaluate. Just look at an extremely simple 3-body problem with 2 fixed large masses and a single moving small mass (plenty of simulations available on the internet). Averaging say 30 runs with close initial starting points would have no validity of, in any way, representing an expected system. It would be of no value/meaning at all except the obvious that total kinetic and gravitational potential energy will be a constant. We have one climate system and I’m afraid it’s evolution will be chaotic and unpredictable in terms of significant climate patterns and their possible repitition. Looking at the past and expecting to predict longer term evolution will be futile. Prediction of more storms, fewer storms, stronger storms, weaker storms as the CO2 pereturbation continues will be futile and diseingenuous to suggest that we can. We have cycles of El Nino and La Nina at present, we have no idea if that will continue or another regime will evolve (emerge) sooner or later and whether that will be good, bad or indifferent. We’ll have no idea if CO2 was a driver either. That’s chaos in it true mathematical/physical form. The fact of the matter is that all moments in time in this universe are unique. If they weren’t, then the universe could not be expanding. Doonman ==> If it is expanding, which is currently being contested.. I understand that the challenge to the expansion of the universe is the notion that it’s expansion is accelerating. I think you’re right … just a point about how seemingly finished science sometimes falls apart after more research. Kip, I thought it was whether or not the rate of expansion was accelerating, that was being contested. Not expansion itself. Mark ==> You’re probably right– just an example of how things that are sometimes decided and done, are re-visited and come up different. Kip, if I understand the argument, some of the apparent patterns in weather might have no “cause” other than the chaotic workings of the system. So solar variability might not be a direct cause of things like the Little Ice Age. Tom Halla ==> The first bit is true — apparent patterns appear spontaneously in chaotic regimes. The second bit on solar variability or solar cycles is possible, but not implied by Chaos. Solar input is a major parameter of the climate system, and changes in it could have out sized (non-proportional) effects. One question regarding the solar effects: What can one say about chaotic systems and repetitive input signals? I recall some work on encrypted communications through synchronized chaotic systems where there are two chaotic systems which provide the encryption and decryption keys, respectively. By applying the appropriate (and secret) signal to both chaotic systems, they both follow the same path, thus providing a coherent key. Paul ==> Boy, that’s deep! But there are two keys to understanding this — chaotic systems are totally deterministic. If a set formula is run multiple times with exactly the same starting point and parameters, the outputs will be identical. Therefor, they use synchronized chaotic keys to encrypt and decode — and through a subtractive process remove the identical chaotic signals, leaving only the added-on information. In reality, what they do is much more complicated, but that’s the basics. Mmm. You are right to say that we can’t predict the future of chaotic systems now, but that doesn’t mean we can’t one day, or that we can’t predict SOMETHING about them. Even if its as trivial as ‘the worlds icecaps wont melt in the next 500 years’. Also we may find that although climate is chaotic there are strong negative feedbacks that constrain it to a fairly small area of climate response. Leo ==> We will not be able to do numeric long-term climate prediction, not as this is commonly understood, and no amount of additional computing power or more data on a finer scale will change this. Non-linear dynamics (chaos) simply makes it impossible. We can, of course, come to better understandings about the Earth’s climate, its repeating patterns and associations between those patterns — and thus improve weather prediction and maybe even near-present (next month, next season, the coming winter) general predictions. The fact that the climate system is constrained to a fairly narrow range helps in enabling general prediction out a bit in time — but not long-term, as the profound sensitivity to initial conditions, as shown in the 30 Earths paper, makes each prediction different, not only quantitatively, but qualitatively, after even short time periods. But then there are the macro factors. Ms. Valentina Zharkova of Northumbria says that cyclical sunspot theory predicates a steep cooling on the horizon. This should sound familiar to all here as much of us have been saying that seems likely given the 1,500 year convergence of sunspot cycles in 1998. Most chaos simulations assume a reasonably steady-state set of inputs and internal conditions, the object being to demonstrate sensitivity to small initial changes in these. However, remember that these are deterministic systems! In any physical system one can determine overall response to a large, or periodic, perturbation, and it is not unreasonable that our climate would respond in a significant way to such events. Exact prediction is, of course, impossible, as is long term prediction, but one can predict a general path for quite a ways out. Look at the Lorentz picture: in general, you can follow a part of the track for quite a ways; there are relatively few places where it does sharp bends and goes off in a completely new direction. Paul of Alexandria ==> Remembering that the Lorenz Attractor does not represent the climate in any real way. My general comment is that , while “Climate Change” was the term used from the beginning of the IPCC , it was the assertion of catastrophic increase in our global mean temperature caused by changes in the spectra of the atmosphere , AlGoreWarming which is the trillion dollar destructive boogeyman . Climate is infinitely more complex than mean temperature which is totally determined by the energy balance over what would be called a control surface in Heat Transfer courses around the planet and atmosphere . The issue of mean temperature is more akin to Gas Laws than understanding the internal chaos . The internal eddies are , as evident here , a far more complex issue , but have only minor influences on the radiative flows thru that control surface . There is no spectral phenomenon which can explain ( which means quantitative equations ) why the bottoms of atmospheres are hotter than that calculated for the control surface around the lumped planet+atmosphere . So that is a separate issue too . Bob Armstrong ==> It is an oddity that the Climate Science world has focused on a single metric as if it were the be-all and end-all of things climatic. The metric they use, a bizarre blending of near-surface air temperature averages and sea surface water temperatures averages, is non-physical and, in many senses, nonsensical. It only tells us what the current situation is with retained energy manifesting at that moment as sensible heat. You look at politics in general tho , and the mental level reduces to the mode . And reducing the issue to a scalar reduces it to the 1 dimensionality of Left-Right politics . I have never seen any quantitative functional unfolding of that scalar mean to the continuous climatic dance . Climate is not chaotic; the only chaos is in the thinking processes of most all climate ‘scientists’, who have unnecessarily over-complicated the entire climate field due to a complete over reliance on the idea of feedbacks, which is due to the huge gaping hole in their understanding of solar variability effects. The only climate ‘attractor’ is TSI/insolation. A true attractor story concerning North America’s largest heavy truck assembly plant, published in Journal of Strategy in 1999 as ‘A new productivity paradigm’. We built a nonlinear dynamic model of the plant using a modelling tool, STELLA, developed at Dartmouth. This was done in order to predict improvement impacts of various operational effectiveness stratagems. One thing the model did was predict a sharp fall in quality (evidenced by trucks needing rework after the end of the assembly line) if the ratio of special option orders to standard option orders crossed a threshold about 50-50. The plant ordinarily operated in high special order (60-70%) ‘chaos’ with lots of rework, all quite expensive. So we cooked up a four month experiment, giving dealers significant price incentives (equal to rework costs) to standard order. Sure enough, rework fell close to zero as special orders fell below the threshold. And at the end of the trial, rework shot up as special orders increased past the threshold. Like a toggle switch two lobed attractor. The strategic answer was a permanent change in pricing policy. Specials were repriced up, standards were repriced down. Was the very first peer reviewed paper applying nonlinear dynamics ‘chaos’ theory to manufacturing. Climate is a heck of a lot more complicated and interactive than heavy truck assembly. The climate models haven’t a chance. Arguing they deal with boundary conditions rather than initial conditions isn’t right as this post shows. CMIP5 gets two boundary conditions significantly wrong. There is no modeled tropical troposphere hotspot. And modeled ECS is ~twice observed. ristvan ==> Thanks for checking in and contributing. Great story about the truck plant. True but when external outside sources such as the sun change enough they are going to have a climatic impact , which is happening now as the sun goes into a prolonged minimum state of activity. Cooler global temperatures will be forthcoming. The only problem I personally have with Chaos Theory and climate is that climate is not a dynamic system, it is not weather, not even weather in long term. Anywhere I look at the data I see no any initial condition responsible or required to be,. The periodicity and climate cycling supports this even at the point when considering so much error and misinterpretation of data. Not correct. It is a system in that it follows known laws of physics (Boyles, Newtons, etc) and one can apply these laws to the current state and inputs to determine the next state (one second from now, one day, one year, etc). The problem with a chaotic system is not that you cannot predict future states, but that you have to have an amount of information approaching infinity to do so accurately into the future. Whitten, all nonlinear dynamic systems produce mathematical chaos. That does not mean they are always chaotic, as my truck assemply plant example shows. A nonlinear system is simply one with feedbacks. Water vapor, clouds, albedo… a dynamic system is one with time delays. Since climate feedbacks obviously do not act instantaneously, climate is by definition a nonlinear dynamic system, therefore mathematically chaotic. Just as TAR said. Which means no one should rely on any climate model output. An inescapable fools errand. You see ristvan, there is a problem for me there. I think I understand your point made, hopefully, and I appreciate it, but you see there is a permanent condition there that I have problems with, which in my mind stands as a contradiction and a pardox ………the main thing of GHE, the permanent condition of the radiation imbalance being always positive even in its variation over time. it is a permanent condition, not an initial condition, not actually allowing for any other assumed random initial condition to default it, is permanent and static over time…………Even Al Gore knows this much……..
As I have said it before this is a result of trying to explain climate and climate change only by radiation physics………………and that is what I think a fools errand. Thank you for your reply to me. Whitten, the no feedback GHE is always positive. Basic physics confirmed in the lab. Don’t confuse equilibrium with nonequilibrium conditions, or any of the,other silly stuff (gravity gradients) out there on the web. The main issue is Earths secondary feedbacks to that primary forcing. Now, that is a big uncertainty. Opinions very from high positive to negative. My own opinion after 6 years of reading many hundreds of papers and doing my own unpublished analysis is, positive but about half of modeled, ~1.6-1.7 rather than 3-3.2. So no CAGW. And because the likely Bode value is ~1.25-1.3, well behaved with no runaway. Unlike Monckton. But if you have been following, you know those arguments verbally and mathematically. Best single paper on observational sensitivity might be Lewis and Curry 2014. Regards. quickly — suggesting that the climate is bi-stable rather than chaotic. region will be between X and Y degrees 99% of the time would tell you what crops you could plant. It’s important to note that the values approach the attractor, but never (or seldom) actually equal it, or repeat themselves. If the values ever exactly repeat a previous value than the system – being deterministic – will simply repeat the same path again (and would probably not be truly chaotic). Paul of Alexandria ==> Take a look at the earlier parts in this series — a dynamical system, which is chaotic in some regimes, can be extremely persistently stubbornly stable, they can be periodic, and they can be chaotic within bounds. In the chaotic realms, some dynamical systems do get into repeating loops from which they do not emerge. 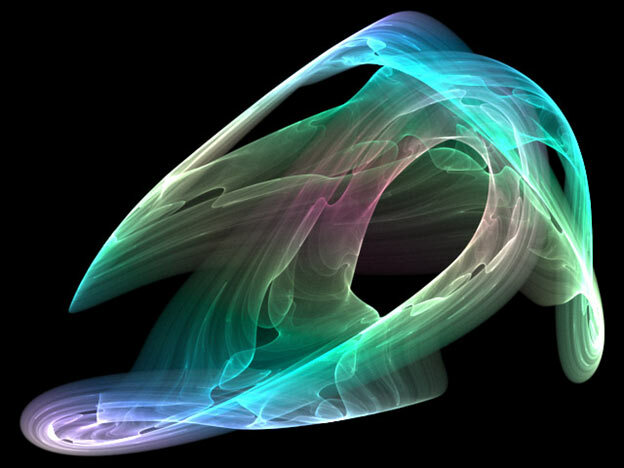 Chaotic attractors are regions of phase space that the system can not escape, etc etc. But, yes, if a system has a single point attractor (for a particular set of parameters and initial values) then that exact system is in a stable, non-chaotic state. Thank you. It is also possible, I suppose, that for a given system some combinations of inputs and states are chaotic and some are not. It’s not just the climate system. Closer to home, a human life is a chaotic process, with a known source in the scientific domain: conception, and a known sink: death (however imperfectly described), while the states and transitions between conception and death are unpredictable except in limited frames of reference (i.e. scientific domain). It’s so complicated that only government-paid scientists can understand it. O.64285 is the reciprocal of a fibonacci number . One divided by O.64285 is 1.55557. 1.55557 is NOT a Fibonacci number because Fibonacci numbers are integers. I’m not sure what your point is, 1/0.64285 = 1.55557, not a Fibonacci number. phi, what the ratio of two Fibonacci numbers converges to, is 1.618 (hey, I remembered the equation) and of course, its reciprocal is 0.618. So you aren’t trying to describe that either. The point is: “O.64285 is the reciprocal of a fibonacci number.” is a false statement. You are confusing the golden ratio (1.618034) , which is the limit of the ratios of successive terms of the Fibonacci sequence. Ratios and reciprocals are two different things. Splitting hairs over 0.05 ? I’m sure somewhere in the universe it matters. Good enough for climate science. LOL, in Definitions you “forgot” to define climate. Trying to understand how the climate operates from an Earth bound perspective is like trying to understand how a gasoline engine works by observing if from within the combustion chamber. We can model the chaotic combustion process and if the model is detailed enough, we can even predict how much horsepower will be produced. We can also calculate how much horsepower will be produced by applying basic thermodynamic principles to the inputs and outputs and avoid the complications of chaos. The IPCC and consensus climate science makes the climate system seem far more complex than it really is and the reason is to provide the needed wiggle room to support what the physics can not. It’s the difference between calling the climate a chaotically coupled surface/atmosphere system and a causal thermodynamic system responding as a unit. The later is easier to quantify, but doesn’t get the result they need, so they invoke the former and bamboozle you with complexity to support the answer they want. The only long term attractors relative to the surface temperature are the requirement for equilibrium and the Stefan-Boltzmann LAW. The apparent chaos in the climate system is more about the transition from one state to another and not so much about what that end state will be, but this chaos is weather and not climate. Sure, there can be changes to the system that can make local variations in weather seem more extreme and even have a small effect on the average, but the global average climate (end state or the average temperature) is only a function of the total sunlight received modulated by slight variability in the average yearly albedo. Given a constant system and constant solar input, the only factor that can make a difference to the average is a change in the average albedo. Increasing CO2 slightly changes the system, but has little effect on how the system responds. Sorry guy, but there is no “…constant system and constant solar input…” Otherwise I’ve always enjoyed your POV. Varying only one variable at a time when quantifying a system response is best practices for system analysis. Even the IPCC does this with their metric of forcing and sensitivity which is equivalent to the final effect of one additional W/m^2 of post albedo solar input, keeping all else constant. We can also keep the solar input and albedo constant and vary the system by doubling CO2 which is effectively what is done when considering that doubling CO2 is EQUIVALENT to 3.7 W/m^2 of incremental post albedo solar input power (forcing per the IPCC definition). That is, both have the same ultimate effect as long as the other remains constant. The real climate system is certainly more complex, and the system itself is dependent on the state (the temperature), but we can quantify this by observing how the system changes between winter and summer and of course, CO2 emissions, concrete and particulate emissions all change the system too. There are certainly meta-stable states in the surface energy distribution, for example, El Nino, but they often have an offsetting state on the other side of equilibrium, for example, La Nina and these redistributions of energy have subtle effects on the dynamic state, but if you’re trying to model El Nino’s, La Nina’s and other meta-stable states, you’re not modeling the climate, but are modeling the weather. Ironically, the argument that the system is perfectly stable, is justification that CO2 is indeed evil. Given a perfectly stable system (i.e. operating withing a stable envelope), any perturbation can force catastrophic change through direct or cumulative effect. This is incorrect. A system that is stable and operating within a stable envelope for a very long time under the influence of a variable stimulus is so because any perturbation, large or small, does NOT cause a catastrophic effect. This can even be shown mathematically (Bode 1945). Note that there’s a difference between a time varying response (a changing system) and a time varying stimulus, although both can result in equivalent effects. Stability is an attribute of the system, but a time varying system is not necessarily unstable or even a requirement for instability. This is perfectly correct. The climate has been relatively non-chaotic for 10,000 years or at least inhabiting a fairly narrow range as atmospheric and oceanic chemistry remain fairly unchanged. There has been nothing to nudge the climate in any particular direction, just a steady rise the Holocene optimum then a steady decline, give or take one or two minor perturbations. Now things are changing fast, extremely fast; the system may, repeat may, be getting a shove. Dumping aeons of stored carbon into the atmosphere in the geological blink of an eye is surely in the realm of a shove. Rising temperatures may, repeat may, be the start of the system flipping towards some new attractor. There is evidence suggesting the risk is non-zero. I get it that most reading this will disagree, that hasn’t seemed to have stopped the steady decline of Arctic ice nor glacier retreat – the two obvious early indicators. You are surely jumping to conclusions here. On what basis do you think that CO2 is pushing the climate? If your authority comes from the IPCC’s conclusions, then I feel sorry for you as having been completely bamboozled by fear driven propaganda crafted for the political end of redistributive economics under the guise of climate reparations. Sure, CO2 is a GHG, but the physics quantifies the maximum effect incremental CO2 can have and its quite small at about half of the lower limit claimed by the IPCC and the ‘feedback’ they claim amplifies this tiny effect into something massive is based on a broken analysis that assumes a source of power other than the Sun and assumes that the relationship between forcing and temperature is linear, moreover; what they claim to be this small pre feedback result is actually the final result after all feedback, positive, negative known and unknown has had its effect. Nothing about contemporary temperature trends is unusual. The ice cores show that the RMS change in temperature of multi-decade averages (see EPICA DomeC data) is almost exactly what we are seeing today in the short term averages. The null hypothesis suggests that the warming we have seen in the last century is the highly predictable recovery from the LIA, especially when analyzed after the fact and considering that claims to the contrary are supported by nothing more than unsupportable rhetoric. You just scored a “safety”… made an “own goal”. Both of which are manifestations of cyclic phenomena, of course. And therefore, not causes for alarm. I’m talking about changes to a potentially chaotic system and the possibility that changing the physical and chemical characteristics at such an extreme (geological) rate may have surprising effects. Just my opinion guys. Apparently the science isn’t settled so I think the possibility is real and that it’s prudent to consider. You’re worrying about an impossibility. The rate that the system is changing relative to CO2 concentrations is insignificant. It’s nothing more than a small, gradual increase to the baseline GHG effect which is otherwise modulated at a high rate and magnitude by the dynamic effects of water vapor and at any one time varies over a wide range across the planets surface. The climate system is perfectly adequate at handling arbitrary changes in GHG concentrations, or even a major disruption to the system as has happened many times before with volcanic eruptions and impact events. Precaution is an option when there’s the possibility of a real danger, but excess precaution in the form of expensive preemptive action must be framed in the context of acceptable risk and cost benefit analysis, especially when the perceived danger is speculative, the risk is demonstrably small, the claimed effects are theoretical, the mitigations are widely considered ineffective as many smart people dispute the danger, risks and effects on solid scientific grounds. Right, so the science is settled? Well, the physical laws that tell us that the sensitivity is far less than claimed are immutable. One of these is the Stefan-Boltzmann LAW and I emphasize LAW, while CAGW is a speculative hypothesis. This law tells us that emissions are proportional to the temperature raised to the forth power, Conservation of Energy tells us that surface emissions must be offset by input power, otherwise the surface will cool. 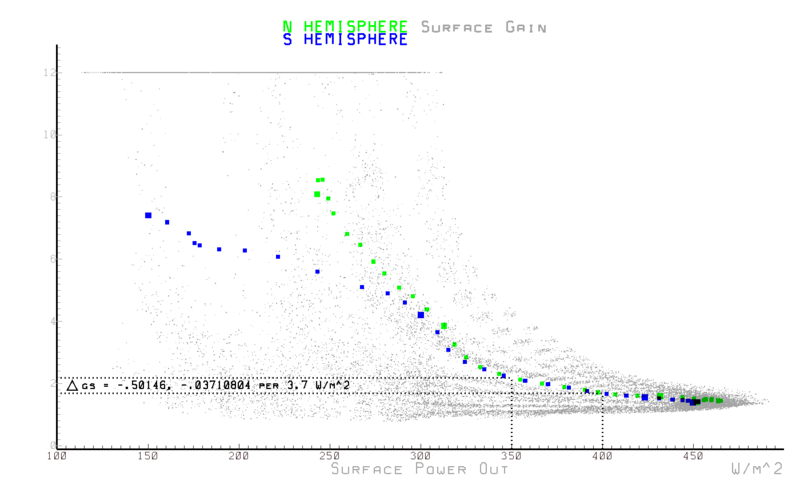 The slope of the SB curve at the average temperature of the planet is less than 0.2C per W/m^2 while the slope at the 255K emission temperature of the planet is about 0.3C per W/m^2 and these set the upper and lower bounds of the sensitivity which is well below the 0.8 +/- 0.4C per W/m^2 range claimed by the IPCC and the self serving consensus it crafted around its claims. Each of the 239 W/m^2 of incident power contributes to the 385 W/m^2 of average power emitted by the surface for a total contribution of 1.6 W/m^2 of surface emissions per W/m^2 of input forcing. If we add 1.6 W/m^2 to the 384.7 W/m^2 emissions at 287K and convert back to a temperature, the new temperature is about 287.3K (0.3K per W/m^2) which also sets an upper limit since owing to the T^4 relationship, the incremental sensitivity must be less than the average and the average is 1.6 W/m^2 of incremental surface emissions per W/m^2 of incremental power albedo solar input (forcing) corresponding to a sensitivity of only 0.3C per W/m^2. So to be sure, the sensitivity is not completely settled, but it is definitely between 0.2 and 0.3 C per W/m^2 and not between 0.4 and 1.2 C per W/m^2 and this much is unambiguously settled. The “normal” science? Indeed it is, pretty much. As to the “Post-Normal” science, that’s a different matter altogether. I appreciate your thoughtful reply co2isnotevil. It’s been a long time since I immersed myself that deeply in physics so I need a bit of time to digest it. At a cursory level am I mistaken thinking that Boltzman’s Law is more properly associated with ideal black bodies? If that is the case – that the Earth is not such a body – what considerations need to made? Is there a possibility that CO2 forcing, while insufficient by itself, may be enough to precipitate a rapid methane release which then could be the nudge the system needs to break out of it’s ‘stable’ state and abruptly shift to a new equilibrium? No. The Stefan-Boltzmann law relates emissions and temperature. A black body is just the degenerate ideal case of unit emissivity. The more general form is a gray body which characterizes a non ideal black body and which covers all possible emissions from a body or surface consequential to its temperature. From space, the Earth looks a lot like a gray body whose emissivity is about 0.61 when you consider its temperature to be the temperature of the surface. BTW, the surface itself (i.e. without the effects of the atmosphere) is a nearly ideal black body (after counting for reflection) and even Trenberth and most other warmist scientists concur. Adding an atmosphere makes this ideal BB surface look like a gray body from space and this is what consensus climate science incorrectly denies. The SB Law and COE were settled science long before the IPCC started to distort climate science where they have precipitated massive lies based on disinformation arising from the arrogant assertion that these basic physical laws are somehow not settled science. No. This is one of those BS hypotheticals they put out there to scare people. In fact, methane only acts in a very narrow part of the emissions spectrum and contributes only a tiny amount to the total GHG effect, most of which comes from water vapor and CO2. Even ozone is a bigger contributed than CH4. The CH4 concentration is largely irrelevant as it affects so little of the emission spectrum. tony, from whence comes your delusion that adding CO2 to the atmosphere is a forcing, much less a major one that threatens to destabilize climate? When it comes to the fact that CO2 is a minor player in climate changes. Yes it is. Again thankyou for your concise reply co2isnotevil. I guess I remain open-minded about all this. I see some of the reported effects like shrinking glaciers and diminishing sea-ice and I have to wonder to their cause. I understand that many here will say they are just natural cycles and that may be the case but the rate of these changes lead me to think there may be some anthropocentric factors. What makes you think that there’s anything unusual about the current rate of change in ice? Surely this rate of change is far, far greater when entering or leaving ice ages. As the LIA was ending, the rate of ice advance was so fast in the Alps that monks were dispatched to slow it down. Those at the IPCC will have just as much luck trying to slow down the retreat especially since they’re relying on virtually the same methods. If you are worried about human intervention, you need to refocus your angst on people like Holdren and MacCracken who have delusions of climate control by geoengineering. This is only true if we don’t know what the future states of solar activity will be into the indefinite future. Now, we might be on the threshold of knowing what solar activity will be a few cycles ahead, but that itself still remains to be seen. Regardless of whether we can confidently know about the magnitude and duration of future solar cycles, with my solar model, we can model what the climate response would be due to whatever future solar activity cycle scenarios we can dream up. 2016 is a year that came in hot from previously high TSI during the SC24 max, and is going out cold from the fairly rapid drop-off in TSI in this year. Is that concept in anyone else’s model? Doubtful. Rephrasing my earlier comment, there is no chaos to the sun’s weather and climate effect, only in most people’s understanding of it. That was not a dig at Kip etal. Thank you for writing an interesting article. Bob Weber ==> It is certainly true that the Sun is the energy source for the climate system, with some energy still being added from the Earth’s core (planetary origins). It is true that the Sun is “fairly” constant, but not absolutely constant, nor is the Earth’s orbit (physical relationship to the Sun) constant. Similarly, the Sun’s output is not only not absolutely constant, but the makeup of its radiation is not constant, with solar flares and solar storms throwing out scads of differing radiation and particles. There are many working on the Solar/Climate problem, seeking to understand what solar changes cause or contribute to what climate changes. It is an interesting field. Probably no and this is independent of what the climate does, although there’s a better chance to feed a larger population if it gets warmer. Mankind will survive regardless of what the climate does and isn’t that all that really matters? One of the worst misconceptions about climate science is that it is all about warming. Climate science should be concerned about warming and cooling equally, but since the politics is only concerned about redistributive economics under the guise of climate reparations and only warming by industrialization can justify these ends, the means is to be concerned only about warming. The answer to your two questions would appear obvious. First: Yes (whether it warms or cools). Second: No. 50 years is far too short a period for the oceans to significantly expand through warming, or rise through land based ice melt. The vast volume and heat capacity of the oceans is a great dampener to the system such that any significant change will be a slow process. Perhaps I should expand a little on my reasoning in view of the comment by CO2isnotevil that crossed with mine. There is no such thing as global warming. Warming is regional, some parts of the globe are warming faster than others, and some parts are either not warming or perhaps cooling (data suggests USA and Greenland have both cooled since the 1940s). What does it matter if high northern latitudes particularly the Arctic warms somewhat? Further, it appears that the warming consists mainly of higher nighttime lows (ie., it is less cold at night), and Autumn starting a few days later and Spring coming a few days earlier. What’s not to like about that? With cheap energy we can do anything. There appears to be plenty of shale and coal so we have cheap energy for 100s of years, if only Governments would let us use it. There are vasts tracts of the arable land that is simply not being used. Heck we have so much food stuff that we ca afford to burn it (bio fuels) rather than eat it. Tons of food is thrown away or stock piled to keep prices up. it is no big deal globally if the grain/wheat belt migrates slightly. with genetic engineering we can modify crops whether it warms or cools (although I accept the point that CO2isnotevil makes that cooling is more problematic). One thing that history demonstrates is that man is extremely adaptable. If that was not the case, our ancestors could not about 70,000 years ago have left Africa and colonized the globe going right to the Arctic circle. We will meet the challenges of any change. Ironically Richard, 70,000 years ago humans almost went extinct. Humans are part of the system not separate from it as many would have you believe. Driving too many SUVs, were they? That probably wouldn’t have helped. Outside of the scientific domain, there is no chaos, only perfect characterization and modeling. Let’s hope the scientific domain remains so perfectly known and predictable, despite observable and reproducible evidence to the contrary. 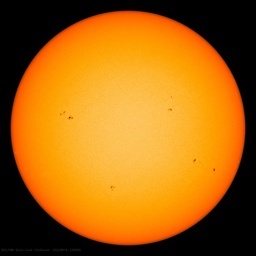 Bob they do not want to accept the fact that it is the sun that governs and determines the climate of the earth. Salvatore this will change. C/AGW is already terminated – it’s just that very few know it yet. If I believe anything, it is that the extended scientific community is vastly under-informed on this subject, and that this audience will respond to proper persuasion that includes solid theory and evidence. The earth is so super sensitive to TSI that it’s short-term to long-term influence can be readily seen with the right information. Even if I didn’t say another word, I am confident that due to the rapid solar cooling we are undergoing now, one by one doubters will come around, and no later than one year from now most of the skeptics will be on board, with 95% of the stragglers coming in after they see first hand the effect of the upcoming cycle minimum. The very last few will hold out until they see the TSI driven ENSOs that will occur at the onset of SC25 and after the peak of SC25, confirming the timing and pattern of previous solar cycle driven ENSOs. By the end of the next solar cycle maximum it will be understood worldwide. The warmists will have no where to run, no where to hide. Technically it is already over for them, whether they know it or not, or whether they’ll ever believe it. Weather and climate operate on extremely simple rules based on solar activity and insolation, not CO2, and it is most definitely not chaotic on a gross level. I look forward to the day when we will be discussing the entire topic in much greater detail. That is not a given, considering that the next cycle will be no weaker [and probably a bit stronger] than the current cycle. LS I appreciate your insight on this subject. However you are not fully up to speed on what I’m saying, due to no fault of yours. The climate response to whatever the sun throws at us in the next cycle can be understood in context of the response to previous cycles, and if SC25 is stronger, the solar climate signal will be that much clearer. I am confident that even you will be persuaded by my research. Mmm, no, of course they don’t Salvatore. Do you accept the fact that the atmosphere has any affect? Kippen Hansen, let’s make it short: it’s not just the problem with computer models; it’s with the conditions of the real world. produces a completely different November 25, 2016 at 04:32 pm. Cause that’s how the real existing world runs. Johann Wundersamer ==> Yes, the real world weather/climate system is chaotic [as in Chaos Theory] … that’s a very important point and I hope that readers who have slogged all four parts of this series have come to realize that. – there’s ALWAYS a completely different April 12, 2021. THE CLIMATE MODELS ARE USELESS – they are useless because they do not factor in the initial state of the climate correctly they ignore the strength of earth’s magnetic field which moderates solar activity which the models have no clue on how to account for, especially the secondary factors that effect the climate due to solar variations much less the solar variations themselves. They are useless and I have more confidence in my climate outlook then any worthless climate model may predict. I have put forth those solar parameters /duration of time which I feel are needed to impact the climate and I think going forward the solar parameters I have put forth will come to be which will then manifest itself in the climate system by causing it to cool. I dare say I think it has started already. We should know within a year as prolonged minimum solar conditions become entrenched. Actually. no Salvatore. Are there any graphs here https://wattsupwiththat.com/global-temperature/ that would support that position? One minor quibble. The increase in the amount of CO2 in the atmosphere has made the planet greener due to increased efficiency of photosynthesis… biology. Increased plant life has an impact on climate. So biology has an impact on climate…just like physics does. And then there’s biology ==> Yes, true, and that photosynthesis captures and stores some of the energy retained by GHGs. Let’s complete <a href="https://www.ipcc.ch/ipccreports/tar/wg1/501.htm"the thought, shall we, Kip? I get it that you don’t understand that we only <a href="https://judithcurry.com/2016/10/05/lorenz-validated/#comment-815456"get one realization of actual events to work from, but your inability to “get it” is a poor excuse to continue misrepresenting what the IPCC has to say about the very real challenges involved in figuring out what a complex non-linear chaotic system *might* be expected to do in response to relatively abrupt changes in external forcing. Still sleeping on that rubber sheet and telling stories to scare the children, Brandon? Still beating your wife with non sequiturs, catweazle666? I’ll repeat my complaint above that in this series, while you have talked a lot about chaos and attractors and drawn trajectory plots, I don’t believe you have ever plotted an attractor, or said anything quantitative about them. They are important, since they are what takes the randomness out of chaos. And they are the analogue of climate in chaotic weather. with ρ=28, σ=10, β=8/3. Note again that the system is autonomous – time does not appear on te right hand side. That means that you can generate trajectories forever for the same attractors. For GCMs that isn’t true. But what is important is that while the trajectories change radically for small change in initial conditions, the shape of the attractor changes continuously with the parameters. This is analogous to the dependence of climate on forcing. Incidentally proving that was #14 of Steve Samle’s problems, solved in 2002(but numerically generally found to be true earlier). It is tracking the slow variation of that attractor (climate) with forcing that is the essential GCM climate problem. It has nothing to do with the initial value issues people are hung up on here. I will write up something on this on my blog. Nick ==> The best evidence against your point is given by Milanovic at Judy’s recently. There is no doubt, however, that the climate operates inside of some sort of space that has the appearance of an attractor (the historical climate record) and that inside that space we find all the attributes of chaotic systems in general, both in physical space and time. It is possible, because of this, that in time we might be able to recognize repeating patterns of “fractal-like” behavior inside that space, and work up some sort of probabilities in a very general way. That is light-years away from useful long-term climate prediction or projection by numeric climate models. Nick ==> we might actually be able to agree on the last two paragraphs above….yes? Here’s a plot of the surface gain on the Y axis (surface emissions / total solar forcing) vs. surface emissions along the bottom. Sure looks a lot like the behavior of an attractor, albeit it a trivial one with only one destination, which is a ratio of about 1.6 for the surface gain or 1.6 W/m^2 of surface emissions per W/m^2 of forcing. Each dot is 1 month of data for a 2.5 degree slice of latitude of the planet extracted from the ISCCP cloud data set covering about 3 decades of weather satellite data. The larger dots represent the average over the entire sample period for each slice. To what can the two lobes be analogous? Ice ages? ENSO? Droughts? All? How long does the climate take to span its phase space? Certainly a ‘stable’ few thousand years could be oscillations about islands of stability. Why are models initialized to closely match current conditions? Won’t the attractor reveal itself regardless of initial conditions? Do modellers expect to determine the attractor and tease out sensitivity in only 100 years of t? The two ears case is just for one set of parameter values. chosen presumably for appearance. I don’t think there is a climate analogy for this shape. As I said, climate isn’t autonomous, so this isn’t very meaningful. By the time of “spanning”, conditions have changed. They aren’t, and yes. Models are usually started “wound back” – to maybe a century or more ago. The idea is that it is better to let the less well known early initial state settle down than to use recent data which may, through lack of resolution or inaccuracy, be far from the attractor. Good question. Again it comes back to non-autonomous relations. They are trying to observe a moving attractor. One compromise is to look for TCR (transient) measured over 70 years. But that may vary with time. This is the general shape for a solution space with pair of quasi stable states, where the system is stable in either given the same stimulus, but can be easily pushed one way or another by orthogonal factors. El Nino/La Nina is an example and there are many others. The composite shape corresponding to the actual Earth climate system response is the sum of a lot of smaller shapes with 2 or more lobes which when combined provide a solution space for the background ‘noise’ centered around a steady state dictated by COE requirements. The take away should be that all this chaos is nothing but weather and that weather is not the climate. Ice ages and interglacials are not an example of quasi stable states with the same stimulus, as the stimulus is a function of orbital characteristics with asymmetry between hemispheres and given the characteristics as compared to other similar times, global scale glaciation is not sustainable and we should either be in an interglacial period or transitioning into one. The chaos is around state pairs that are much closer together. On the ice age side of the climate, there is an extenuating circumstance that makes ice ages deeper, which is increased reflection from increased surface ice and snow, however; we are relatively close to minimum possible average ice already and this albedo effect can only enhance future cooling but lacks the dynamic range to have much effect on future warming. Can’t a non-autonomous system be converted to autonomous one? Looks like two big lobes and a fair bit of noise to me. And not a sniff of a relationship between temperature and CO2 in sight. Oh, and it seems inevitable it is going to warm up quite a bit sooner or later, whether we want it to or not. I tend to agree – many lobes over many time scales. Ice ages and interglacials are not 2 stable solutions given the same stimulus and do not fit this pattern. Ice ages and interglacials are unambiguously related to changes in the Earth’s orbit and axis. This is not chaotic noise, but a causal response to a quantifiable change. The solution space certainly has many lobes over many time scales, but the lobes are close together (i.e just on either side of balance) and the time scales are short since the climate systems time constant is only on the order of a year. If it was the decades to centuries claimed by the IPCC, we would not even notice seasonal change since the response would be too slow. So, let’s dump 30Gt into the air and see what happens. Where’s my popcorn. Not usually. Non-autonomous means the equations (coefficients) change with time. To find an autonomous set which admitted the same solutions would be extreme good fortune. Nick ==> While I disagree with your point, I look forward to seeing your post on it. where ke is Coulomb’s constant (ke = 8.99×109 N m2 C−2), q1 and q2 are the signed magnitudes of the charges, and the scalar r is the distance between the charges. The force of interaction between the charges is attractive if the charges have opposite signs (i.e. F is negative) and repulsive if like-signed (i.e. F is positive). Forcing something will produce a resistance and the result = Heating . The harder the electron has to work to hold the molecule together the hotter it gets . This is a great article on an important subject, but careful though is needed as to where chaos-nonlinearity actually move the climate debate. To say “climate is chaotic so can’t be predicted” is an exaggeration and provides alarmists with a straw man to burn and a pretext to crow to one another that they have seen off again the threat of chaos to their orderly and simplistic doom architecture. Among all the details of chaos theory, the most important message of chaos should not be lost. This is that chaotic-nonlinear dynamics, together with the vast ocean heat content and its sharp temperature gradients – especially vertical – that climate changes itself by internal chaotic dynamics. Talk of climate change as always requiring external forcing exposes profound ignorance of chaotic dynamics, or alternatively, denial of chaos. – A negative Lyapunov exponent, often associated with dissipative damped systems, makes outcomes converge to an attractor. 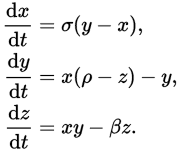 – Degrees of freedom in a number of parameters that provide the dimensions of a phase space within which a negative Lyapunov exponent and chaotic attractors can emerge. ptolemy2 ==> This quote: “To say “climate is chaotic so can’t be predicted” is a doppleganger of the real quote which is: “… therefore the long-term prediction of future climate states is not possible.” And this conclusion was not drawn from “sensitivity to initial conditions” alone but from the expanded study of dynamical systems in general. Lorenz’s computer bug turned out to be “initial conditions” and passing his paper around got a lot of people excited and looking into different aspects of what later was named Chaos Theory. All your points are valid of course, they are part of the field. Thank you for bringing them up. Many thanks for these posts on Chaos. Chaos as used in this post appears to adopt a standard but typically unspoken assumption that one knows all of the variables at play very well, even as strange attractors emerge from the repeated numerical experiments. That’s easy to see for any who work with nonlinear dynamics and the analytical and numerical implementations thereof. But what if all of the variables and/or mechanisms are not truly known? Then the concern is not really about chaos but rather about epistemic uncertainty. In other words, how do we really know what we don’t know? One way to advance is to consider alternative conceptual models, and run exercises for those. Then it would prudent to compare the forecasts to the data.. and also compare that validation exercise to the prior conceptual models and their predictive offspring, and see which model does a better job. It doesn’t necessarily solve everything, but if a better model is found, perhaps the chaos argument becomes somewhat more moot. I love chaotic topics and am sure they will never go away in key aspects of climate science. But in this case, given my reproducible experiences, they may not be the true obstacle. Mike ==> A lot of attention is being turned to the “uncertainty” issue in Climate Science — Judith Curry has been discussing it for some time. And yes, uncertainty is what we know, what we don’t know, what we don’t know we don’t know, …. In this essay today I point out that one of the things we don’t know is if the climate system has an attractor?, and if so, what does it look like? I do offer my best guess that the historic climate record reveals at least the limits of the attractor-like behavior of the climate system. Perhaps it is much simpler than that. Climate scientists and many others declare that since the TSI changes only fraction of percentage point that the sun can not be a principal driver of climate change. Climate change as seen through the global temperatures periscope is result of a finely balanced system, which can be disproportionally thrown off from its natural tendency towards equilibrium even by the smallest of changes. The biggest attractor re: climate change is Earth (Ground) Half of atmospheric heat is a process of the resistance build up between Earth and Sun.http://physicsworld.com/cws/article/news/2011/jul/19/radioactive-decay-accounts-for-half-of-earths-heat If you stand back and look at Earth as a complex molecule and like all molecules , it’s surrounded by a cloud of electrons . Earth surface is like a giant Van de Graaf generator . The spark that is produced between ground and atmosphere we call lightning, even if you don’t see a spark the exchange of energy still takes place. A low pressure system works in the up direction and can produce foul weather and a high works in the down direction good weather . In the real world the climate change caravan moves on while the skeptic dogs bark. In the town where I live the mayor forbade the use of plastic shopping bags. Protesters stop pipeline construction. The federal government will introduce a carbon tax. I hope you all are having a good time. The left of course is driving the camels. I was intrigued by the NCAR/UCAR images, but it seemed to me that comparing the ensemble mean (EM) to the observations cannot produce a valid measure of natural vs. man-made contributions. I assume what they’re saying (although I’m grossly over-simplifying) is basically, if you look at the observations, and “subtract” off the EM, you get humanity’s contribution (or, they somehow “parse out” the contribution). But, the reality is the climate isn’t “an average” of all possible climates, so if the natural state were actually image 24, then we contributed much less (if any at all) to the warmth. Am I missing something here? P.S. I have long understood that the climate is a“coupled non-linear chaotic system, and therefore the long-term prediction of future climate states is not possible,” but astounded that the IPCC seems to have forgotten that. Barbara Hamrick ==> You have it exactly right — the ensemble mean of 30 chaotic outputs is only the mean of 30 chaotic outputs — nothing more — nothing less. I wrote an entire post on this at Climate Etc titled Lorenz Validated. You’ve pretty much nailed the central point. Thanks for reading and commenting here. That we only have one realization of the actual system from which to work might be a good candidate, Barbara. > P.S. I have long understood that the climate is a“coupled non-linear chaotic system, and therefore the long-term prediction of future climate states is not possible,” but astounded that the IPCC seems to have forgotten that. Rather the focus must be upon the prediction of the probability distribution of the system’s future possible states by the generation of ensembles of model solutions. Addressing adequately the statistical nature of climate is computationally intensive and requires the application of new methods of model diagnosis, but such statistical information is essential. That is light-years away from useful long-term climate prediction or projection by numeric climate models. Quite convenient that searching an effectively infinite state space is required before being able to make useful policy decisions, innit. …one can realize a ring network, wherein each of the 30 nodes is a single-transistor chaotic oscillator comprising only 5 discrete components, and is resistively coupled to its neighbours (Fig. 1, Fig. 2). The circuits can be tuned to oscillate chaotically, in other words, to retain deterministic dynamics but operate in such manner than small fluctuations are rapidly amplified in time. if the oscillators are coupled with intermediate strength, they spontaneously form communities of units that preferentially synchronize with one another. In other words, very small signals through the intermediate oscillators synchronize much larger signals in separated units. This could explain, for instance, the apparent observed synchronization between planetary alignment and solar activity. A “driving” action is not necessary, simply the kind of chaotic synchronization mentioned in the paper. My thanks to all of you who have read this and the three earlier parts of this series — and to those who have joined into the conversation here in the Comments Section. A lot of good insights and interesting questions. Those with pressing questions left unanswered can email as above. I’ve tried explain a physical basin of attraction. There’s a lot of water. Some of it is strongly attracted to Greenland but most of it on any give day is not. Sea ice could also be a basin of attraction as would be the sea water near it. Humidity level changes can be thought of as basins. The fact that water is so important to climate coincides with its ability to change form as with a bifurcation diagram as well as its information carrying ability and memory. Another example is a lake in Minnesota. In fall the evaporation rate is high until it comes to about a full stop when it ices over. The Winter basin of attraction is don’t evaporate. The Summer one is to.